One of the toughest jobs that a family faces when a new puppy comes home is getting the dog housebroken. This means that the dog will eliminate outdoors and not use your home and furnishings as a toilet. 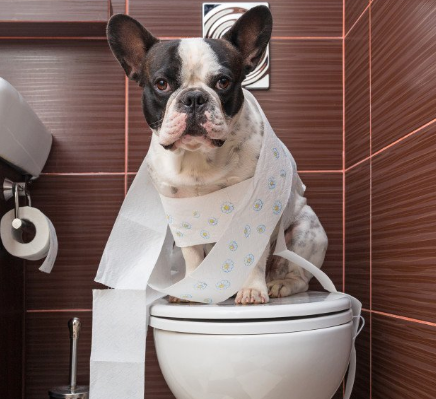 Lots of people think that getting doggy toilet trained is a tough task, but it doesn’t need to be. If you arm yourself with plenty of information for the best ways to get your dog house trained, you are on the right path to having a dog that goes to the bathroom where you want him to go. A dog can be toilet trained at any age, but the best age to begin is between eight and twelve weeks old. If you set up a housebreaking routine as soon as you bring your puppy home, before long he will get the right idea of where to do his business. A crate is a great tool for toilet training a puppy. It keeps him confined when there is no supervision and most dogs learn quickly that if they make in their crate they will have to sit in it. Most dogs are fairly hygienic and won’t enjoy having to sit in dog doody or urine. Be sure there is enough room in the crate for your pup to turn around, but don't leave so much room that he will be able to eliminate and lie down far away from it. Many dog owners view a crate as a jail cell or to use as punishment, but your dog will love having his own space where he can escape from the hustle and bustle of the household for some quiet time. Make your dogs crate a happy place and don’t use it for punishment. You can feed your dog in the crate, or while he is in there, offer him some treats. Place a favorite chewy or toy in there with him, add blankets and he will have a cozy den to escape to whenever he feels the need. Utilizing a crate for your dog can keep him out of trouble and not only in housebreaking. Keeping a close eye on your puppy is a key factor in getting him properly housetrained. Whenever you see that he is sniffing, circling or beginning to squat, immediately take him outside to the place where you want him to go and see if he eliminates. If he does, praise him lavishly. A good idea is to have a cue, such as “hurry up” so that your puppy knows what you want him to do. When he is going to the bathroom repeat the cue and then give your dog lots of praise for a job well done. It is better to take the dog out and nothing happens then take a chance of an accident happening. Feeding, watering and walking your dog on a regular schedule will make housebreaking that much easier. Puppies are like children and they thrive on a routine. Try and take the dog out around the same time everyday so they will be able to adjust their bodily functions. The first thing you should do in the morning is take the puppy from the crate and don’t let his feet touch the ground. Bring him to the place where you want him to go, give the cue, and praise upon a successful completion. Take your puppy out at least every two hours, after eating or drinking and especially after play. Before you know it, your puppy will be letting you know it is time to go out and do his business. Letting your puppy roam around the house is a sure fire way to have accidents. If you have decided you don't want to use a crate, and even if you do use one, confining the dog to certain areas of the house can make housetraining easier for everyone. It is difficult to keep track of a puppy when he has the run of the house, but if you gate him in the kitchen, he will still be able to be part of the action and can be better supervised in case of an accident. There will be times when you first begin housetraining that you feel your pup is just not getting it. He may have accidents in the house as well on occasion. There is no need to be discouraged. If you stick to your routine, keep a good eye on the dog and make frequent outings to his outdoor bathroom, in no time your puppy will be housebroken. Another good idea is to use the same door all the time when you are taking him out so that when he has to go, he will scratch on the door to be let out. Once this happens, you can say hurray and know that your puppy truly is beginning to understand that going to the bathroom in the house is a no-no. 0 Response to "6 Great Tips For Getting Your Dog Toilet Trained"